SALT LAKE CITY, May 26, 2016 – A Utah mountainside collapsed 4,800 years ago in a gargantuan landslide known as a "rock avalanche," creating the flat floor of what is now Zion National Park by damming the Virgin River to create a lake that existed for 700 years. Those are key conclusions of a new University of Utah study that provides the first definitive date for the landslide and estimates its size and dynamics, including a speed likely as fast as 180 mph. The study of the slide was published today and featured on the cover of the June issue of the Geological Society of America's journal GSA Today. "The ancient Zion landslide would cover New York City's Central Park with 275 feet of debris," says Jeff Moore, the new study's senior author and an assistant professor of geology and geophysics at the University of Utah. "And you would need 90 times the volume of concrete in Hoover Dam to recreate the mountainside that failed." The Sentinel rock avalanche also "would bury Salt Lake City's Liberty Park 2,340 feet deep, which is almost a half mile," Moore adds. The huge landslide had a volume of 286 million cubic meters or 10.1 billion cubic feet — 4.4 times bigger than Utah's 2013 Bingham Canyon copper mine landslide, one of North America's largest historic, nonvolcanic landslides, with a volume of 65 million cubic meters or 2.3 billion cubic feet. The Sentinel, at 7,157 feet elevation on the west side of Zion Canyon, was bigger before the slide 4,800 years ago, "but a large portion of it is now gone," Moore says. Computer simulations matched known landslide deposits and show the huge slide rushed southeast across Zion Canyon in about 20 seconds, with an average speed of 112 mph and a peak speed of 180 to 200 mph. "It was certainly moving more than 150 mph when the huge wall and peak crashed down," Moore says. Then, for 30 more seconds, the slide debris spread up and down Zion Canyon. "By a minute it was pretty much done." "The original deposit was 2 miles long and just under a mile wide," with a maximum thickness of 650 feet and average thickness of 310 feet, he says, adding the landslide's lower end is at the road junction "right at the mouth of Zion Canyon." "This catastrophic landslide of massive proportions had two effects," he says. "One was constructive — creating paradise through cataclysm. More than 3.6 million people last year enjoyed the flat and tranquil valley floor of Zion Canyon, which owes its existence to this landslide. The other aspect is the extreme hazard that a similar event would pose if it happened today." Moore says that "within the relatively small confines of Zion National Park, there is evidence for several deposits of large valley-blocking landslides," two within the past 5,000 years or so: The Sentinel slide and another, about one-fifth as big, in Hop Valley in the northern part of the park some 2,600 years ago. Despite such severe, large prehistoric landslides, they are extremely infrequent and "we have no evidence that something like this is imminent," Moore says. The 4,800-year-old landslide deposit still produces many smaller slides, including one in 1995 that damaged the road between the visitor center and the lodge, Moore says. Moore defines a rock avalanche as "a very large failure of a solid-rock slope — as opposed to soil — with characteristic very fast, long and flowlike movement. Because of their large volume, they are relatively rare." Both the Sentinel and Bingham Canyon slides were rock avalanches. Some people initially thought Zion Canyon was flat because of glacial debris, like Yosemite Valley in California. It is unclear when the Sentinel landslide was discovered, but it first was described in a scientific paper in 1945. "We have conducted a rigorous and complete analysis of this landslide for the first time," Moore says. The study concluded the landslide most likely happened 4,800 years ago as single event, with a range of uncertainty so that it could have happened as early as 5,200 years ago or as recently as 4,400 years ago. The method exploits the fact that after a landslide, boulders atop the slide have surfaces exposed to the sky for the first time. Particles from incoming cosmic rays begin to hit the boulder surfaces, creating beryllium-10. The longer a boulder is exposed, the greater the amount of beryllium-10, allowing scientists to determine when the boulder's surface first was exposed by the landslide. With permission from the National Park Service, Moore and colleagues sampled 12 boulders from the landslide's surface, crushed the notebook-sized rock samples and analyzed their beryllium-10 content. Moore says previous estimates of the landslide's date were from indirect methods, including radiocarbon dating of lake sediments that gave ages of 3,900 and 4,300 years. Another study estimated the slide was 7,900 years old. Scientists don't know what caused the giant landside. "We found no evidence indicating there was an ancient earthquake at the time, but there's not a detailed record of paleoearthquakes in the Zion area," Moore says. "Rock avalanches frequently occur with an earthquake trigger but just as often occur with no apparent trigger at all." The collapsed peak included sandstones from the Navajo and Kayenta formations, and the latter includes some weak shale layers that might have aided the slide. To determine the rock avalanche's volume of 286 million cubic meters, Moore and colleagues used a computer and "our best geological judgment to recreate what the canyon looked like before the slide." In a similar way, they then reconstructed the top surface of the landslide before it began to erode. The landslide dammed the Virgin River, and "there was a lake in Zion Canyon for approximately 700 years," Moore says. He calculates that if the river's discharge was similar to today's, it would have taken five to 10 years for the lake to fill. The long, narrow lake covered 2.4 square miles and extended from the north end of the rock avalanche deposit — which is less than a mile south of present-day Zion Lodge — northward almost to The Narrows. With the initial lake surface at 4,658 feet elevation, the site of the lodge was under 380 feet of water. Then the lake breached the top of the landslide dam, the lake surface fell to 4,413 feet in elevation and the lake's area shrank to about 1.2 square miles, no longer extending to The Narrows but only 4.3 miles to the Temple of Sinawava. Sediment amounts produced today by a nearby fork of the Virgin River suggest the lake filled with sediment in 700 years, give or take a century. 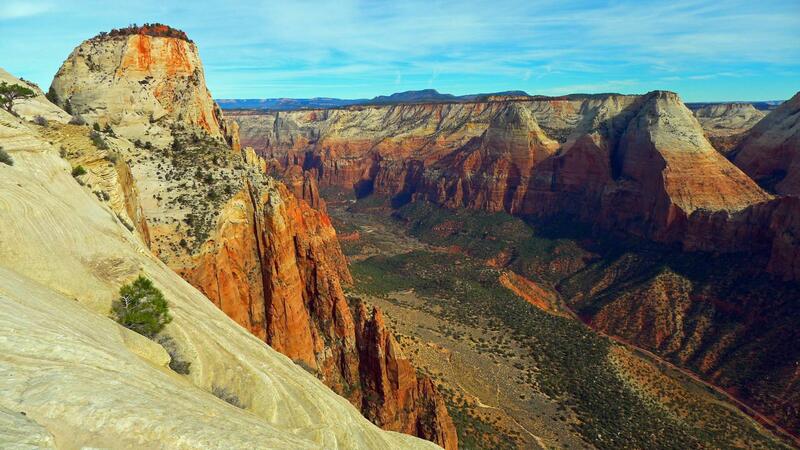 By about 4,100 years ago, the lake had completely filled with sediment, forming the flat floor of Zion Canyon. Moore calculates the Virgin River has eroded away about 45 percent of the original landslide deposit during the past 4,800 years. At that rate, in several thousand years Zion "will again be a steep, rocky, narrow canyon," he says. So Moore calls the landslide "a minute with up to 10,000 years of consequences." Moore notes that large landslides "create habitable land in otherwise steep landscapes around the world. People use flatter areas behind large landslide deposits for farming or to build a village" — although they sometimes are at risk from future slides. The study was funded partly by the David and Inga Chapman Fund, established by students of longtime University of Utah geophysicist David Chapman and his wife. Moore conducted the study with Jessica Castleton, who earned her master's degree at the University of Utah last year and works for the Utah Geological Survey; Jordan Aaron, who wrote the computer code to simulate the landslide's distance and speed and who is a geological engineering doctoral student at the University of British Columbia; and Marcus Christl and Susan Ivy-Ochs, rock-dating experts at ETH Zurich, the Swiss Federal Institute of Technology. Media: see reporter's-only section for pre-embargo password to access photos, maps and animations.